When I started this blog, back in those dark days when we feared LJ would be lost forever (though it certainly isn't operating at full strength even now, eh), I dedicated my Dreamwidth to SHERRY, which I'm ashamed to say I somewhat drifted from, hence the years of aridity. However, just the other week, Kerry and I visited Jerez de la Frontera, which is after all the epicentre of all things sherry-related, so it would be remiss of me not to provide an update on this. Well, readers, it was delightful. 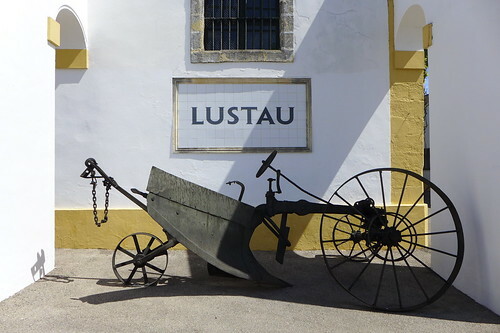 I visited two bodegas in the end, Gonzalez Byass and Lustau. 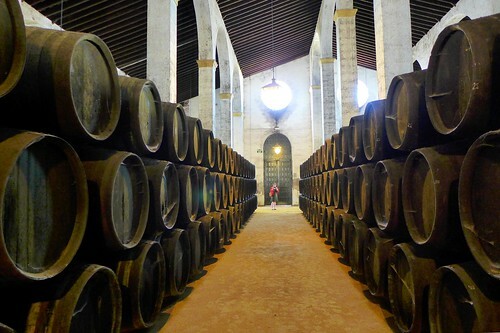 The tours were pretty similar -- there are only so many ways you can gussy up a visit to lots of large, high-ceilinged old warehouse spaces piled high with sherry casks -- though the Gonzalez Byass people clearly had a nicer and larger patch. 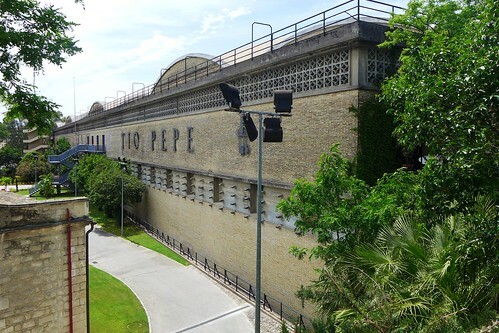 Their signature sherry is Tio Pepe, which is cellared in an ENORMOUS three-storey 60s building (and I'm going to just pretend that Croft's cream sherry doesn't exist, because it's a bit naff), but they also do some nice smaller ranges, generally cellared in smaller spaces which are a bit more picturesque. 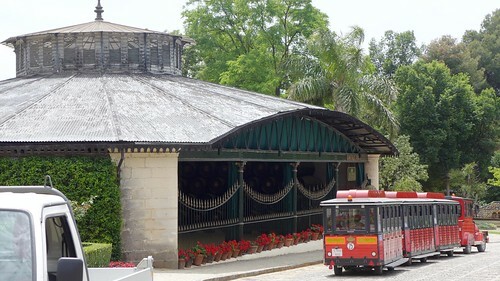 They had some vines planted and lush gardens and a little train to take people around on the tours. 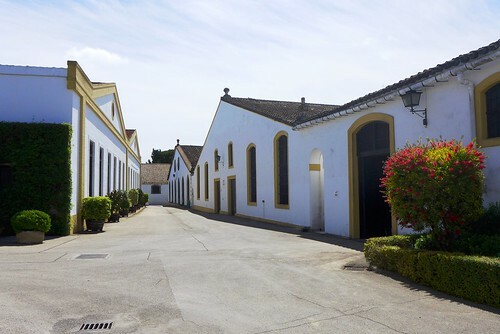 By contrast, Lustau were more straightforward, with a few big warehouses all linked together. Both had the requisite see-through cask to show the 'flor' (yeast) that sits atop the fino sherry barrels to keep the contents from oxidising (it's the lack of this barrier in the higher-alcohol sherries like oloroso and pedro ximenez which give them their distinctive darker colours). 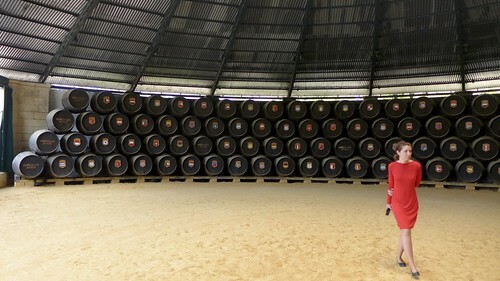 Both had barrels affixed with the flags of all the countries they export to (more for Byass than Lustau). And both had some signed barrels, though Lustau were less interested in showing those off -- then again, Byass had Jean Cocteau, Orson Welles and King Edward VIII (also Prince Philip and other nobs). But the tours were fascinating, and then there was the best part of course, which was the tasting! As a result, we may have brought back a suitcase filled with sherry bottles (all of which survived at least as far as our home, though their days are surely numbered now), and it meant this was a rare holiday when I wasn't tracking down beers. That said, due to the sun and the heat, my first drink on arriving was a cool refreshing Cruzcampo cerveza, but that was pretty much it for the range available thereabouts. In the first bodega visit, there was a Dutch group taking part, and one older couple I talked to were shocked -- SHOCKED! I tell you -- that young people might drink sherry back in the UK. I mean, I did try to make it clear that there were only a handful of sherry bars but that along with all the tapas places which offer good sherry selections, that young people were indeed attending these. I only hope for a resurgence in interest beyond yr elderly granny, but I am certainly keen to continue my IMPORTANT RESEARCH into sherry by continuing to drink it. I entirely neglected to BLOG about the Sunday before last, when I had a glass of sherry. Yes, you will have gathered from my radio* silence that I have not drunk much sherry recently. Well, the occasion was a birthday meal that Kerry arranged for me, to my local tapas place (well, as local a tapas place as we can find) in Camberwell, Angels & Gypsies. Let me just say right away that it's a nice place, with a good atmosphere, and a good range of interesting, inspiring tapas dishes. Everything we tried was tasty, and not TOO small. They also have a page or two of sherries on the menu, as you'd hope and expect. I asked for a glass of Delgado Zuleta Amontillado, though I fear I received a glass of Delgado Zuleta Fino instead (I recall the waiter saying "fino" when he served it, and it wasn't until I'd already started drinking that I realised the error). 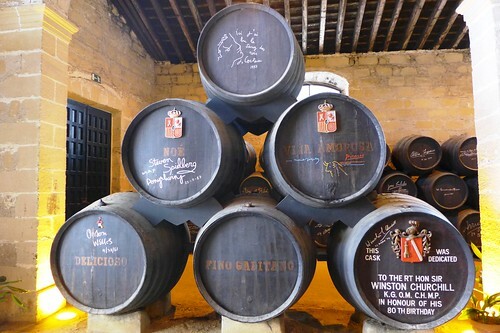 After all, the two styles of sherry do taste slightly different. However, I cannot complain too greatly as after all it was still very pleasant. Even better was the Delgado Zuleta Cream that Kerry ordered. I had a sip and it was really rather lovely, without some of the more acerbic notes that I got from the fino (is "acerbic" the word? I'm not sure it is). And despite the name, FEAR NOT, it did not involve actual cream. I'd personally suggest to the good people of Bodegas Delgado Zuleta that they avoid the word "cream" as it does rather conjure hideous imaginings of Drambuie, Bailey's and the like. The place also had an extensive list of, rather randomly, rums. They were good, but this journal does not concern itself with rums, so I shall not elaborate. So that sherry research I was planning on doing? Well, it happened! Last night, myself, superpitching, kake and kerrypolka made an expedition to Bar Pepito, aforementioned sherry bar, near King's Cross. Well, it was tiny: four teetering high tables with table-tops made from sherry barrels, with four stools to each. And it was hot; there was a large fan behind the bar, and another at the other end of the room, pointedly (at least, to us, sweltering in the heat) not turned on. The place is built into an old warehouse -- as indeed is much of this newly-reclaimed area, the Regent Quarter -- with not much space at all, and certainly no room for much in the way of air-conditioning. This is of course a downside for customers in the Summer heat, but it turns out it's not always good for them either; they opened about 20 minutes late because, as the friendly guy running the place (only the one, though another came to help out with the tapas later on) told us, the refrigeration units had failed overnight leaving them with a lot of dead sherry to throw out. We gainfully offered to dispossess them of this stock, but that was being a bit hopeful probably. Anyway, we settled into the menu, which includes helpful tasting notes. They have about three sherries each for a variety of styles (Fino, Amontillado, Palo Cortado, Oloroso seco, Oloroso dulce, Moscatel, and Pedro Ximenez), and as such offer 'sherry flights' for most of the different types, which come out as pretty good value (around £7-8 for three different sherries along with a matching tapas). We ended up with a flight each, did a bit of swapping of the nice ones, and then agreed on our favourite two and ordered a (375ml) bottle of each. So we drank quite a bit of sherry in the end: this wasn't exactly planned, I must say. We also tried a fair amount of the tapas on offer: a lovely duck pate, practically melted into the plate in the heat; some tasty little sausages; almonds in their shells; and best of all, surprisingly perhaps, the pan con tomate, which was, as the name suggests, just bread with (chopped) tomato on it, but was lovely. We ended up with four portions of that. So, the sherries, you ask? Well, our favourites were the Lustau Puerto Fino, which was described as "bready ocean" by kerrypolka, and the sweeter González Byass Solera 1847, the dry Oloroso moderated by a bit of Pedro Ximenez to give a nice easy drink. I mean, there were other nice sherries too, of course, but those were the ones we took a bottle of for further drinking. We finished with some PX (González Byass Nectar) which was sweet, viscous and raisiny, and I know kake didn't like it, but the rest of us thought it was fine. Though, thinking about that, I'm reminded of an early taste of PX out in Córdoba (earlier this year), when every restaurant finished by giving us a glass of PX (they didn't say what it was at the time, but as our sherry palates have extended, we managed to figure it out), and I initially found it to be pretty horrid. Acquired taste, maybe? I had a sip of sherry last night. There wasn't very much left in the bottle at all, so it was literally a sip. Two, maybe, at a stretch. It reminded me that sherry is quite nice and that I need to try more of it. 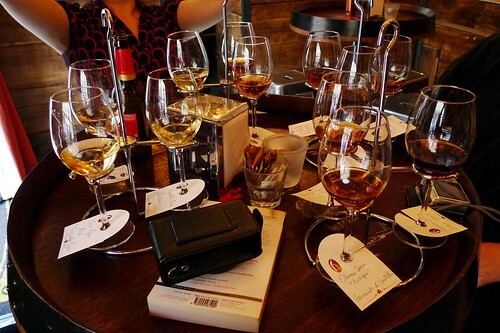 There's a sherry bar in London. I plan to visit and report back. ¡Hola! I have returned from a holiday in Spain with many tales of sherry drinking. Actually, if I'm being honest, I have no tales of sherry drinking, as we did not imbibe any. However, the local wine to Córdoba is D.O. Montilla-Moriles, and is very dry indeed, though not fortified like sherry. It was rather nice, the glass of it we tried in the Taberna Salinas, from the friendly waiter, as well as the glass in the Bodega Guzmán, poured from a barrel behind the bar. The other thing that we tried -- not consciously, but in two places (the above-mentioned Salinas, as well as the Taberna Campos) it was FOISTED upon us -- was a very sweet, viscous, dessert wine, which I suspect was the Moscatel, as it was almost raisin-flavoured. On the plus side, it was on the house. The one in Campos was superior (less sticky), but either way I'm not sure I'd have consciously ordered it. I don't know where you stand on sherry and curry matching. Is it possible? I haven't tried, I have to admit right away. I don't think I've even considered drinking sherry with a curry, but who knows, maybe it would be a great combination? I think maybe a drier sherry might go well, but it's hard to say, mainly because I've never really considered it, at all. This one isn't tenuous. I actually touched my lips to the edge of a glass of the East India and drank from it. It went quite nicely with dessert, which was just the end of the pot of coconut & lime ice cream, lovely stuff, congratulations Waitrose. Obviously this is the MAJOR news in my life at this time, though I might add I have leftovers for lunch today. It is apparently called 'taco salad', and clearly a work of genius since its "salad" qualities are fairly minimal (iceberg lettuce, a bit of tomato, lots of MEAT and CHEESE). However, it will be tasty I have no doubt. I am thinking about it a lot, mainly because I am already hungry. In the Scand1n4vian K1tchen this morning, a woman was very insistent that her tea was too milky and asked the chap to get her one stronger. He gave her an extra teabag to add to her existing mug of too-milky tea and there was a tense moment of eye-to-eye contact which seemed to stretch out for aeons before she INSISTED on it being re-made because having the boiling water is MUY IMPORTANTE, SEÑOR. She wasn't Spanish, I just threw that one in there because, hello!, taco salad. Anyway, I did find her tone rather aggressive, though I also obviously considered her point to be entirely fair and reasonable (black tea does need to be made freshly with boiling water). In the end, the slight petulance of the chap serving her when he realised he would have to make another mug of tea for her (this time, milk on the side) made me incline more towards her side in the CONFLICT. Current Music: "Sober", by Kelly Clarkson. Oh Kelly, how I laughed. I am not paid until this weekend, which means I have about £70 to last me for the next few days, what with being rather overdrawn. * a plastic holder for cleaning pads and the like with suction cups for sticking to the back of the cupboard door in the toilet, I think (I haven't quite figured out where to put it, I just like the idea of being more organised with the ephemera of cleaning). * bottle of dry sherry (if I'm being perfectly honest, I didn't look for any, and I didn't actually entertain any thought of buying some right now, but this journal has had a theme thus far, and I might as well try and fit it in to EVERY post, eh). And I also backed quickly away from a woman banging on at some hapless JL staff member about where their chamois leather could be found... "NO! Not leather care products. It's MADE of leather! YOU DON'T EVEN KNOW WHAT IT IS! YOU IDIOT! WHERE IS YOUR MANAGER? WHERE?!" I didn't really know what it was either (esp. given the pronunciation appears to be "shammy" and not "sham-WA" as I'd have expected), but I've looked it up and now I do. This entire post has been brought to you by #entitledmiddleclass, because it's too long for Twitter and that's where I usually put that stuff. I have no sherry update for today, I'm afraid. I saw the bottle in my fridge, gently chilling as per the serving instructions, and I had a sniff of it to verify that yes, in fact, it still smells like sherry. So there's that. But I was heading out to see a gig by one of Jo's bands. Jo isn't on Dreamwidth; in fact, she's barely on LiveJournal anymore, which is a pity, as her updates are always so wonderful to read. But anyway, one of the bands put out by the label she works for were doing a gig, Tune-Yards. It's basically just one woman doing weird vocal things and tape loops. Lots of tape loops. But the gig was amazing, one of the best I've seen this year (okay, that's from a list I could count on my hand, but still, it was amazing). She has a really powerful voice, which she uses to great effect. Plus she just seems so happy and upbeat, which is great to see in a performer, better than sullen and sulky, as so many of our indie stars are. I say "our", but she's American of course. So, no sherry was the point I was making. Maybe soon. As is customary, I shall post my sherry updates here. I acquired a bottle of that Lustau East India sherry I enjoyed so much at Barrica. It was £9 from Waitrose for a 500ml bottle and it seemed like a good thing to go with dessert on Valentine's Day, alongside the cava with the starter and the red wine for the mains. Wine/food matching is very important when one is putting together a meal, especially one on quite so important a national holiday (oh wait? it's not?) as VD. I've never celebrated it before in pretty much any form, because, well, I mean, it's a bit naff as a concept. What's it dedicated to exactly? Chocolate boxes? Little toy fluffy bears with lovehearts on them? Well, no, as long as we can refocus it on food and drinking and watching awesome TV shows while curled up on the sofa all day, then actually it turns out that Valentine's Day is pretty good. I like food and drinking far better as a concept, and may extend this activity/holiday matching to further crass commercial celebratory occasions, WHO KNOWS! But returning to the sherry update, I had some of it with my dessert as intended, and it was still rather nice, so good work me. I may roll this out to further desserts in future, though I stopped short of serving it with the dessert course at breakfast. I think a drier sherry is called for at this time of day and I had none, so ended up sticking with orange juice. Hello! Oh Dreamwidth, I don't really use you much, even though over here I am me! And not some Japanese word that makes little sense even to me. I suspect this is just going to me talking to the aether, but that's fine, because I've got to that point where sitting in the same small artificially-lit office all day without seeing any natural light has accustomed me to talking more or less to myself. However, it will be nice to get outside, even if it is bitterly cold. Well, I am all about the LEARNING -- and having something to focus one's learning around is always useful -- so perhaps I shall report back how they were tomorrow. It's Just Like LJ, Eh? I generally try to avoid new social networking sites. I've even been actively removing myself from some. I deleted my Myspace; that was very exciting. Tom asked why: it's very simple, I don't want or need all these places to keep up with people. However, people move around, and you need to move with them to catch them. So now I'm on Twitter as well, because I have friends over there who use it extensively. But there are only a few over here, which means I don't quite get Dreamwidth. If everyone comes here and blogs here, I will come too,* but in the meantime, I remain on LJ.